PJ, I have photos of about 350 Corvair powered aircraft that have been built in the last 53 years. Of these only two or three had 2 carbs mounted on the stock intake flanges. I am going to say that none of these aircraft were even marginally successful. Two of these aircraft had stock Corvair Rochester 1 barrel carbs and the other had a pair of Bing carbs. To cover part of your question, Bernard Pietenpol always used carbs below the engine. In my workshop, carefully protected, is a Ford tractor carb. I treasure this because it was actually BHP’s own carb from an early Corvair conversion. (The carb was a gift from the Mensink brothers.) This carb was mounted on a manifold just like ours, but bolted up to the stock intake flanges on the heads. If you look at the very last page of your conversion manual, it has a picture of BHP standing next to the very first Corvair powered plane, a J-3 airframe. It has this same type of set up. Why is the carb below? For one overwhelming reason: Because the plane can use gravity feed as a fuel system. Virtually every single classic light aircraft was set up this way. It is r-e-l-i-a-b-l-e. Compare gravity feed vs pumps that would be required by carb on the top: Carbs on the top are 2 times the carbs, you need a regular fuel pup, and of course a back up. then you need a fuel pressure gauge to tell you how the pumps are. you need a pump switch, and each pump needs it own breaker or fuse, and this all needs to be connected by wire, and you need to give some thought to better lines and AN connections because it all going to be under pressure. Now, does that sound simpler than having one carb under the engine? BTW, I have dyno tested the same engine with stock carbs, back to back vs a Stromberg from a 65 hp Continental, and below 3,600 rpm they had the same power output. 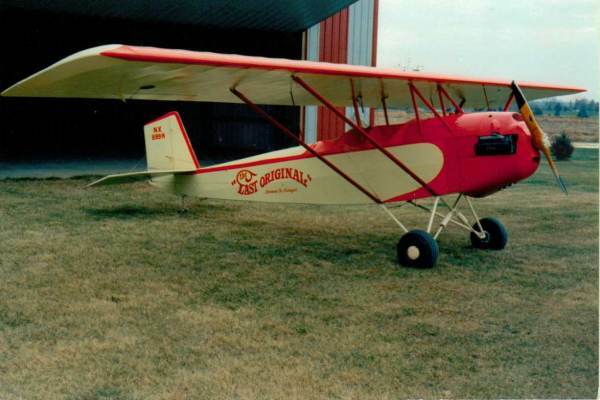 The only person that actually tried to fly two bing carbs on the top of a Corvair was a builder of a “Lite Star” A design that looks like a kitfox from the very respected Canadian designer Morgan Williams. I know Morgan, and he was not fond of this guy, “Pavel” a recient immigrant to Canada from the Czech Republic. As predicted, the plane, which could have used gravity feed, instead a very complex set up and a cowling that looked like a shipping crate. It was a very poor performer. Last I heard from Pavel, (2007) he was in Vancouver and trying to start a business building Corvairs. I reminded him that his signature on the product rights agreement said he wasn’t going to do this, but his attitude was that his word was meaningless, and I couldn’t do anything if he stayed in Canada. My condolences to my friends in the frozen north who are hosting this guy. I really doubt my Great Grand parents had the same attitudes towards their new home land when the came through Castle Garden immigration station in the 1870s. I particularly don’t like Bing carbs. People generally understand that Rotax as a company doesn’t place much emphasis on mechanical longevity, low parts count, simplicity nor field maintainability. Now, if you are going to look at using a carb off another engine, why choose the one that comes from a company that has values that are the polar opposite of things we are working for in the Corvair movement? There are vastly better motorcycle carbs than a Bing. Rotax just uses them because Rotaxes are from Austria and so are Bings. A few months ago I wrote a story about a guy who insisted on using a Bing on a brand new 3,000 cc engine. It leaned out and wasted the engine on flight#1. At the end of the photos I include a 1997 story about the joy of flying Bing carbs. It should change any ones mind, with the exception of a guy in Vancouver. Above, I stand with Chris Heintz in the Zenith booth, sun n fun 2004. Our 601XL in the background. Look at how close the intake tube that is visible comes to the cowl. It is only 2″ above the log. You can’t put a Bing carb on an engine and put a cowl on it that is vaguely aerodynamic. They fit on the top of Rotax 912s because the Gear box makes the thrust line much higher than the crank on a 912. No one ever accused the typical 912 of having a really slick cowling. Above, Louis Kantors 601XL engine installation, built in my hangar in 2009. This is another view of how close the intake pipes are to the smooth cowling lines on a Zenith. We use the same intake on all Corvair powered planes with the exception of the Cleanex and the Panther (Dan sells those, they look nearly identical to ours but are different on the bottom to fit those airframes.) Note that this aircraft has a 45 amp tea cup ND alternator on it. I built a number of these as a test, they work, but there is no call for them. Notice that it displaces the oil cooler and makes the plumbing more complex. Today we are looking at direct drive rear alternators, a more promising idea that leaves the oil cooler in the standard location. Above, three aircraft with carbs below the engine parked in our front yard. L to R, Louis’s 601XL – MA3-spa, Grace’s Taylorcraft – Stromberg, and Dan Weseman’s Cleanex-MA3-spa. The 601/650 is one of the few Corvair powered airframes that uses fuel pumps, almost all others are gravity feed. You might not guess this at first glance, but the Cleanex has no fuel pumps, it is only gravity feed, but it worked great, even during aerobatics. Do not accept complexity without good reason. The 601/650 have the fuel in the wings, which is a good trade-off for complexity. High wing planes can also have the fuel in the wings, but they don’t need pumps. Above is Randy Bush’s 400+ hour Pietenpol at Brodhead. Note the intake pipes. It should be obvious that this plane would have a very blocky cowl with carbs on top. Note that this aircraft has a stock thrust line, about 3″ below the top longeron. There is even less space for carbs on top when we make the high thrust line mounts. 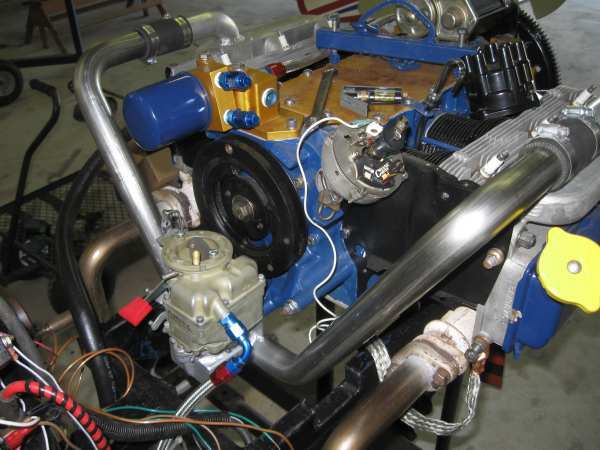 Thats ok because the high thrust line gives more room under the engine for the carb, where it should be. Above, the last original with a stock thrust line. Note the tiny bulges in the cowl to clear the intake tubes on the manifold that connect the carb under the engine to the stock flanges on the heads. Again, no space on this installation for carbs on top, and no reason to have that kind of complexity on a plane that can have simple gravity feed. Most of the people who are looking at a carb on top of the engine are driven buy one of two things: they either want to find a ‘cheap’ carb or they don’t think I know what I am talking about when I say having a low carb doesn’t affect power output. I find the concept that a guy who has tested neither assumes that his guess is more valid that my 20 years of testing pretty annoying. On the subject of low-cost, it isn’t a stretch to say that I know more people building a Corvair engine for a plane than any other person on Earth. While cost may be an initial attraction, the reason why people stick with it is to learn something, be proud of what they have done, and experience this in the company of other like-minded aviators. In the last 20 years, these people have largely been the ones who succeeded. I have good reason to state that the ones looking for something ‘cheap’ were the first ones to quit. Every unexpected penny eroded their reason for building. Conversely, those who where here to learn build and share, viewed a lot of the money they spent as an investment in themselves. If you want to fly cheap, rent a Cessna 150. If you want to do something rewarding, fly something you built with your own hands. When I was little, I wanted to be Jacques Cousteau. It hasn’t worked out that way. Sad but true, the lasting portion of my working life boils down to what I have done with the Corvair. In reality, I am neither overly proud of it nor ashamed of it, just OK with it. This said, none of my work is to show cheap people what they can get away with. My work is to show people willing to make a serious investment of themselves (mostly time), that there are great rewards awaiting the individual who perseveres on his own terms. In 30 years I will likely be dead and forgotten. Between now and then I plan on spending as much of my time as possible in the company on people who want to learn build, fly and have a good time. If I ever seem short with some ideas, it is because my experience allows me to see something that many people miss: This vital finite resource isn’t money, it’s time. Not in the free time sense, but in the years left sense. If you’re not young, nor a millionaire, then you have to make your shot count, you’re not going to get a do-over on this. Let my experience work to your advantage. Build as simple as a plane as you can, work on it every day you can, and understand that some components on it, like the carb, are going to cost money. There is a combination of simplicity/effort/money that can get a great number of people flying. You can be one of them, and the odds that you will be go up dramatically if you use my experience to avoid every mistake I made and paid for. A personal example of why I don’t like Bing carbs; Steve Rahm, our neighbor at Spruce Creek, designed and built the ‘Vision’. It had a Stratus EA-81 Subaru with two Bings on it. Since they basically ran full time carb heat, he wanted to try cool ram air in search of more power. He went as far as testing the set up with a gas leaf blower on the ground. He did this because some people said Bings don’t like ram air. On take off it worked great, until the plane hit 70mph over the trees at Spruce Creek. Then the carbs shut off all by themselves. Plane slowed to 65, power comes back a little. Very skilled flight at tree top level is executed. Several minutes of listening to the rough engine clawing its way around the pattern.